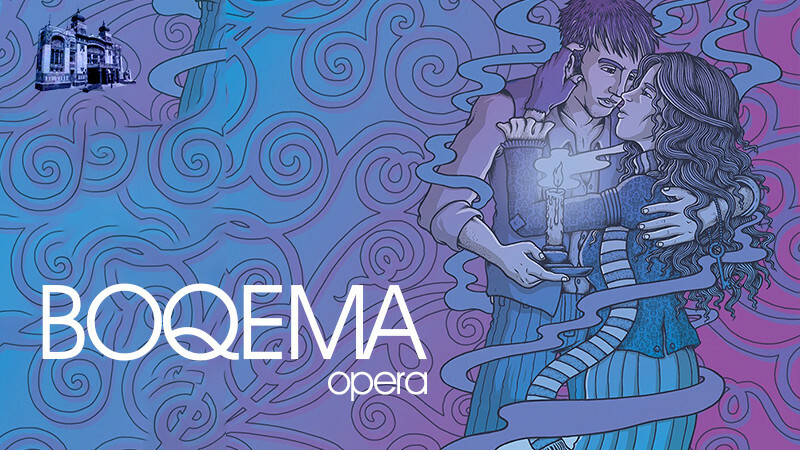 Boqema in Azerbaijan State Academic Opera and Ballet Theatre buy tickets online. Delivery of tickets for the event Boqema. First scene. Attic in Latina quarter in Paris. Poet Rodolfo and artist Marcello unsuccessfully try to work. Room is cold and friends are hungry. But they refer with humor to their diversity. Chilled fireplace melted by Rodolfo’s volume manuscript. Stiffened by cold weather in the street philosopher Colline enters followed by musician Schaunard that managed to get provisions, wine and firewood. Liven up friends merrily act out house owner that came to collect house rent and make their way to the cabaret. Rodolfo stays home by himself as he has to finish an article. Indecisive knock on the door’s heard. Mimi comes asking to light the candle. Warm conversation ensued among youngsters. Finally, Mimi leaves but returns soon after. She dropped key to her room. Candle goes out as they look for the key. Rodolfo’s sympathy towards young lady grows. Mimi’s story about her lonely and simple life deeply touches young man. He confesses about his feelings towards her and feeling is mutual. Friends voices heard from the street. Happy Rodolfo and Mimi join them. Second scene. Latino quarter during Christmas eve. Noise liveliness is one streets and plazas. Rodolfo along with Mimi, Marcello, Schaunard and Colline happily joke around take a sit around the table in the café. Musetta appears during the feast, Marcello’s friend. She’s accompanied by an old man, her wealthy admirer Alcindoro. Musetta left Marcello as she’s had enough of bohemian life. She is still in love with him. Marcello is determined for a revenge pretending not to pay attention. Musetta is irritated by his coldness but Alcindoro’s presence interferes. Finally, solution’s found: she sends off her lover after made up task and happily hugs Marcello. In meantime bill is handed out. Schaunard realizes that he hasn’t got any money. But Musetta finds a way out and offers that her friend will pay on his return. Third scene. Cafe outskirts of Paris. Happy voices heard from the café and Musetta’s laugh. Mimi attends the café for an advice where Marcello and Musetta live and make painting for café’s signboard. Mimi complaints after Rodolfo that made their life unbearable with jealousy. Mimi story breaks by strong coughing. Mimi hides as she notices Rodolfo approaching. During the conversation with Marcello Rodolfo accuses Mimi in being light-headed and flirtatious but then he confesses that his lover is suffering from phthisis. Mimi’s cry gives away her presence. She decides to leave Rodolfo as she finds out the truth. Overwhelmed with sorrow lovers say good bye to each other. Marcello and Musetta’s love didn’t last long. An argument starts between them. Marcello accuses her in unrecoverable infidelity and temporary reconciliation changes into final break up. Fourth scene. Marcello and Rodolfo try to unsuccessfully work in their room. They grieve after their lovers. Suddenly alarmed Musetta appears. Mimi came alongside her but poor girl is so unwell that she wasn’t able to come up. Nervous friends carry in Mimi and lay her on the bed. Room is still cold and Musetta gives her gold earrings so they can buy something for Mimi and invite a doctor. Everyone except for Rodolfo leave. Mimi is happy as she’s with her lover again. But her time is limited. Suddenly she’s short of breath. Friends storm in to the room as they hear Rodolfo scream. Mimi slowly calms down… This is the end… She passes away happy next to her lover and friends that’s why her death looks like a dream. Great melodies sounded. Mimi died. Died, confirming that no amount of money can’t replace love, friendship, warmth of human relationships.